Need something silly and fun to do with your kiddos today? 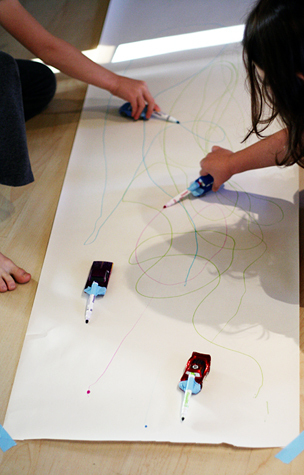 All you need are some toy cars, washable markers, tape, and a nice, long piece of paper for cars that drive and draw! 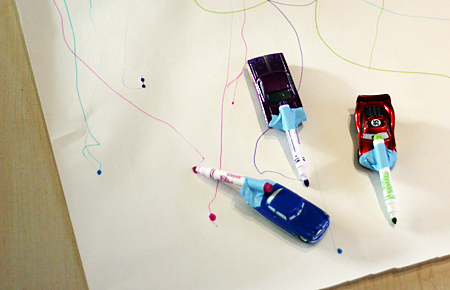 We like driving cars through paint, too – but if you’re not in the mood for paint today, try this instead! Just tape a marker (or two!) onto each car, and start driving. Thanks for sharing such a novel way to draw. I enjoyed looking at your Christmas crafts from last year. I can’t wait to set this up in my 4 year old preschool class on Monday. My girl students gravitate toward drawing and my boy students often choose cars so on Monday the two shall meet! Thanks!